“Hilarious, Touching, Fun”. 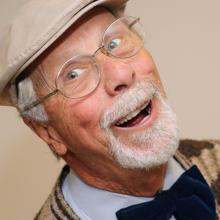 Old Tom takes you, by story and song, through the joys and challenges of living long, laughing hard and loving deeply. Don’t miss the “Old Fart”. Just wondering… did you have a reviewer at the Wednesday opening show? I’ve got a list of who’s claimed each show, but not when they’re seeing it. The best I can say at this point is that there will be someone there, and we’re working to have all of the shows reviewed by Sunday night. Wonderful show tonight. Standing ovation. Sold out show. Had to put more seats in. Thanks to a terrific audience. Singing, laughing and even some tears. Next show Sunday at 4:30pm. We really enjoyed the show on Friday night. Highly recommend it! A playful, light-hearted romp through life, Old Fart reflects on a life lived and lessons learned. Some tech problems hindered the opening performance, but the show uses the stage well with some effective use of props and Tim Bourgard, as always, is a delight. The show itself was predictable at times but endearing throughout, but did retread some of the well worn paths of the ‘quirky senior’ genre. I felt like it could have benefitted from spending a bit more time in the weeds of aging, but in the interest of keeping things light I understand the direction the show took. A silly sing-a-long, Old Fart will appeal to Fringers looking for some lighter fare with a warm heart. Wow, Another SOLD OUT show! STANDING OVATION!! What a great audience. They are laughing, applauding and singing along with the “OLD FART”. More Shows. Tuesday, June 5, 5:30 pm. Thurs., June 7, 8:30 pm. Saturday, June 9, 2:30 pm. Come on out for a fun show!